Furnace: Needs New Water Heater: Needs New Water Lines: Needs New Drain Lines: Seems O.K. Gas Lines: Seems O.K. This home needs complete finishings. 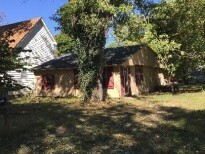 Exterior of home in good condition. Great area close to White river. Information deemed reliable but not guaranteed or warranted. Always inspect property before buying. WARNING! All properties are sold "as-is" and may require major repairs before they can be occupied. Investment financing is offered through owner with no prepayment penalty and no balloon payment. This property is SOLD! It had a sales price below market value with a low down and a low monthly payment. The Term is 30 years which includes a 2 year probationary period as "Rent" or "Rent To Own". The remaining Term (28 years) are under a Land Contract at a fixed rate of interest (investor % rates). There are . . . NO "pre-payment penalties" . . . NO "balloon payments" . . . NO "adjustable rates" or ANY "adverse conditions" to make you lose your property. Taxes ARE included in payment. The only way you will ever lose your home or property... is if YOU don't make your payments. All properties are offered in "AS-IS" condition to be used as investment income properties. Properties may not be rented, lived in or used as a dwelling until property is brought up to minimum habitability standards. Buyer agrees to pay the cost of all repairs and maintenance. Bad Credit? Want a Home? in Indiana, low down payment. About Us· Why Choose Us· Services· F.A.Q.